Weserport in Germany has been deploying a new mobile harbour crane manufactured by Konecranes to handle breakbulk cargo and project loads at its Terminal 1 since the end of June. It replaces the gantry slewing crane, which was previously used and has now been dismantled. The Konecranes Gottwald model 6 mobile harbour crane is not only impressive because of its new drive concept, but also due to its high load-bearing capacity. The load-bearing capacity of the Konecranes Gottwald crane (125 tonnes) is more than twice as much as the previous gantry slewing crane. “As a result, we can now handle individual heavy-duty items with our own equipment,” says Heiner Delicat, Managing Director of Weserport. The new mobile harbour crane is not the first Konecranes Gottwald unit that is in use at Weserport. A crane from the manufacturer’s first generation has already been in service for handling purposes at Terminal 4 for a long time. “Its robust design and reliability, but also the price/performance ratio and the rapid availability of the newly acquired crane were persuasive arguments for us. The mobile harbour crane is also eco-efficient, as it has a new drive system,” says Heiner Delicat, providing the reasons for the company’s choice. This system combines a short-term energy accumulator with diesel engines and therefore not only meets the latest emissions guidelines, but all the future stipulations in the emissions standard for mobile working machines (EU stage V) too. The new drive system also makes it possible to reduce fuel consumption. 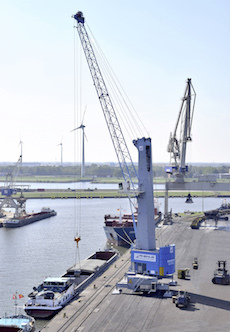 The mobile harbour crane is mainly handling steel and breakbulk cargo at Weserport at the moment. The crane is also due to be used to handle heavy goods and containers in future. By using a motorised grab at the terminal, it is also possible to move bulk commodities. Overall, Weserport has ten handling devices at all four terminals, including eight harbour cranes and two material handlers. Weserport GmbH is a joint venture involving both the Rhenus Group and ArcelorMittal Bremen GmbH. The neutral seaport service company handled 8.3 million tonnes of maritime goods at its four terminals in 2017. The Rhenus Group is a logistics specialist with global operations and generates annual turnover of €4.8 billion. Rhenus employs 29,000 people at 610 business sites.